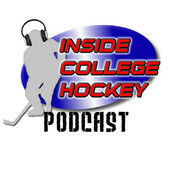 Back by popular demand, the INCH Podcast is here to help you kill some time prior to this weekend’s conference tournaments. We’ve got a lot of ground to cover, so we dive right in and take a look around leagues with an eye on the upcoming NCAA Tournament. With the announcement of the Hobey Baker Award top 10 looming, we discuss potential candidates for that honor. And we’ll give you our early Frozen Four picks as well. Really enjoy listening to your podcast. Can I assume that you’ll have one pre-NCAA?